Phoslock® is the best new technology for reducing phosphorus in ponds and lakes. Phoslock® was developed to remove phosphorus from water bodies and restore water quality in ponds, lakes and reservoirs through a patented phosphorus locking technology. Developed by the Australian national science agency, Commonwealth Scientific and Industrial Research Organization (CSIRO), Phoslock has been successfully used in water resource restoration programs around the world for over ten years. Favorable features such as its low toxicity and its ability to permanently bind free reactive phosphorus (FRP) over a wide range of water chemistries, have rapidly seen Phoslock emerge as the most effective phosphorus inactivation and water quality restoration solution for ponds, lakes and reservoirs. 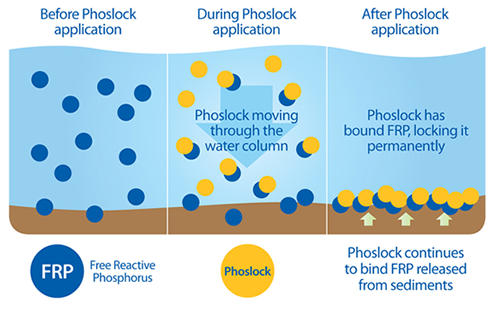 Phoslock has a high affinity to rapidly bind and permanently remove free reactive phosphorus (FRP) from the water column shortly after application. As Phoslock settles to the bottom of a waterbody, lanthanum continues to filter phosphorus by binding FRP released from the sediment on its available sites. The phosphorus bond with Phoslock (lanthanum) is permanent. Phoslock is an environmentally compatible and effective solution in a wide range of water chemistries in ponds, lakes and reservoirs. Phoslock programs require no buffer to protect water quality and aquatic life during and after application. The removal of phosphorus from the water by Phoslock is attributed to lanthanum that binds to phosphate molecules and forms a highly stable mineral LaPO4.nH2O (Rhabdophane). This mineral integrates within the existing waterbody sediments. Significant and measureable reduction in internal phosphorus levels and restored water quality. Phoslock is rapidly emerging as the new standard to remove phosphorus and restore water quality in ponds, lakes and reservoirs.